TABI JONES-WOHLEBER: Hi, this is Tabi Jones-Wohleber, and I’m an AAC specialist, an SLP for Frederick County Public Schools in Maryland, and this is your Assistive Technology Update. JOSH ANDERSON: Hello and welcome to your Assistive Technology Update, a weekly dose of information that keeps you up-to-date on the latest developments in the field of technology designed to assist individuals with disabilities and special needs. I’m your host, Josh Anderson, with the INDATA Project at Easter Seals Crossroads in beautiful Indianapolis, Indiana. 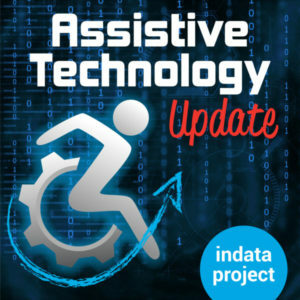 Welcome to episode 395 of Assistive Technology Update. It’s scheduled to be released on December 21, 2018. On today show, we are very excited to have Tabi Jones-Wohleber. She is a speech language pathologist and assistive technology specialist. She has come up with the Model as a MASTER PAL program, which is just a set of tools to use whenever working with individuals who use AAC devices. We are very excited for the interview. This is our last show before the Christmas holiday, so I just want to take time and wish all of you out there, wherever you are, a very Merry Christmas and a very happy holiday season. Hopefully you get to spend time with family or spent time reflecting on the year and how everything has gone. This has definitely been a great year for us here at Assistive Technology Update. It’s been wonderful to be able to take the show over and talk with all of you every week. It has been just an absolute pleasure to be able to do it, and we hope to continue that on into the next year. So thank you all for listening. I hope you have a great holiday season. Let’s go ahead and get on with the show. BRIAN NORTON: Are you a fan of the show? I hope so, since you are listening to it today. But if you are a fan of the show, check out our other podcast, Assistive Technology Frequently Asked Questions. It comes out every other Monday of the month. This next show which will be released on the 24th, so Christmas eve, right after this show here, is Wade’s last episode. As you may or may not know, Wade has also been a contributor on the assistive technology frequently asked questions show. But he’s having to step away from that show just as he did this one. If you can choke back those tears long enough, go ahead and tune into our assistive technology frequently asked questions show on Monday to hear the farewell of Wade Wingler. I’m sure that we will try to get him back on both shows as we can, but there really are no promises with that. So if you are a fan of the show, a fan of Assistive Technology Frequently Asked Questions, or just a huge fan of Wade Wingler, as many of us are, make sure to listen to the show coming out on Monday. Wherever you get your podcast. So with the show last week, you might remember we had someone that used AAC to communicate. You could see how that was a little bit different than some of our other interviews. This week, we are going to talk a little bit more about AEC but from a different perspective. My guest today is Tabi Jones-Wohleber. I think I got her name right. She’s a speech pile just and assistive technology specialist. She’s here to talk about the Model as a MASTER PAL system. Welcome to the show. TABI JONES-WOHLEBER: Thank you. Glad to be here. BRIAN NORTON: We are very glad to have you. Before we get into everything, can you tell us a little bit about yourself, where you are from and what you do? TABI JONES-WOHLEBER: I live in Shepherdstown West Virginia. I work for Frederick County’s public school in Maryland as an AT specialist among the assistive technologies team. I do that part-time, and then I also work with West Virginia Birth through Three as a speech language pathologist. AAC is my passion and I have worked in AAC my entire career as a speech pathologist. I went to Penn State, really fell in love with it and had lots of opportunities to learn from some of the best. It’s a path I’ve always followed and I don’t see that changing. BRIAN NORTON: So let’s get into — you’ve developed a training program called Model as a MASTER PAL. Tell our listeners about the program. TABI JONES-WOHLEBER: Model as a MASTER PAL is a framework that I developed to really get at some of the nuances of interactions between individuals who use AAC in our communication partners. I really set out to positively impact the behaviors and belief systems of the communication partners to help them do that job better. I think we all recognize how difficult it can be to provide all the information there is about AAC. There is the technical understanding and the assessment piece and then how do we use AAC for academics, for social interactions. It’s just so multifaceted. Model as a MASTER PAL evolved as a way to move — I’m school based much of the time – to move communication partners in a school-based setting from a strictly academic focus to really recognizing the role of communication in language development and supporting individuals as a whole person. Model as a MASTER PAL just evolved from being inundated with information through conferences and social media about what best practices were in the going out to schools and realizing how difficult it was to really bring those practices to life. I felt like it was really necessary to provide people in the trenches, the teachers, the SLPs, the parents and other service providers, families, everyone, with information about what it means to be a good communication partner, what quality, meaningful interactions look like, and just to recognize the ways in which we interact with one another and how that sometimes shifts when we are interacting with individuals who use AAC but how being more naturalistic about it can really play such an important role in helping individuals be more confident and effective communicators. BRIAN NORTON: What are some of those best practices? It kind of just walks through a variety of topics related to how to better support communication partners. It of course starts off with “Model,” because that’s how we teach it. BRIAN NORTON: Let’s go through those. We don’t have to spend a full hour on each one, but I know it started off with motivate. I know in a lot of different assistive technology – not just AAC – if the person is not motivated to use something, it’s never going to get used. I like how you started there. But how do you meet it in this sense? TABI JONES-WOHLEBER: Motivate is really at the essence of the human experience. None of us do anything without motivation. Motivation is the driver behind the choices that we make and the activity that we engage in and the things where we decide to invest our time in our effort. Let’s face it, AAC is hard. It’s hard to learn, hard to use, especially early in the learning process. So if the child isn’t motivated, or the individual isn’t motivated to communicate, then we really can’t expect much out of them. It’s an important place to start. Kayda Hern talks extensively about “Model, motivate, and move out of the way,” and how in all of her work, motivation constantly comes up as the driver, it’s the foundation for all of the other things we do. BRIAN NORTON: Moving on to accept multiple methodologies. Talk a little bit more about that. TABI JONES-WOHLEBER: Accept multiple modalities is just relating to the fact that we are all multimodal communication users – or we are all multimodal communicators. We all text, email, have face-to-face conversations, talked over the phone, gesture, use facial expressions, Facebook messenger. We all use multiple modalities. Communication is power. If the child or individual is communicating in some way, it is important that that modality is honored so that they learn that it’s a powerful. Once they learned that it’s powerful, then they learn how to use it in other ways. One of the key examples that I give is if a child has a consistent yes/no response, and they are able to shake their head or verbalize yes/no, we don’t necessarily need to take a real estate on a communication device to add that. We don’t need to redirect them and say, use it on your talker. Recognize that their attempt is meaningful and socially appropriate. We all use those modalities, so it’s really no different. BRIAN NORTON: The next part, statements more than questions. Are we talking about the communication partner? Are we talking about the AAC user when we’re talking about that? There is definitely a need to ask questions. Questions help us figure out what kids are learning and what they know and what they are able to respond to peer but when kids are inundated with questions constantly, they are always on the spot and is not an opportunity for initiation. Statements more than questions really facilitates comprehension. When we take off the pressure and get input – because we know kids need lots of input before they can produce an output — it just opens up our opportunities for more learning and more modeling without backing the child or communication partner into a question corner. That module is actually one of my favorite. It’s probably the longest because it’s such a rich topic. There are so many ways to talk about it and to discuss it and to give examples in an academic setting and with regard to the language of daily routines and language of leisure. It’s very rich. BRIAN NORTON: Very nice. How you described it with young kids and the way we do it, it’s something we do naturally, yet I do see it a lot, folks just asking a lot of questions of folks. This is a show where I am sitting here asking you questions, so probably not the best example. TABI JONES-WOHLEBER: It’s true. I go into classrooms. The questions – we feel like we need to know what their learning, we need to know what they are understanding, and questions seem like the logical path to get there. But I think it’s important to take that step back and recognize that when we are teaching AAC, we are teaching language from a developmental — we are teaching language development. When it happens naturally, we are not aware of our role in our actions as communication partners. But when we are supporting an AAC user, we need to be more cognizant of that role that we play and how our responses shape that Lingwood learning. BRIAN NORTON: The next one is time? TABI JONES-WOHLEBER: Time is two-pronged. That module talks about time in the sense that putting a communication device in place does not a communicator make. Just because a device is provided doesn’t mean that an individual knows how to use it. It takes time to learn language. We talk to kids in the womb and keep talking to them, even though they don’t talk back for a whole year. But we continue to talk to them. So it takes time for a child who is learning to use AAC, time to learn their tool. And not just learn their tool but how to use it in a variety of ways, how to use it to control their environment, how to use it to show their learning, how to use it socially. They need lots of modeling along the way. But it just doesn’t happen overnight. It’s not — learning language takes time. The other side of that is that – that’s the long-term perspective. The short term perspective is in any given interaction, an individual who uses AAC will probably require time to either process their message, processed or question, generate their message. So time is kind of an innate part of interacting with an individual who uses AAC. For those who are confident users, it takes longer to generate their messages, so we have to be patient communication partners. For those — a lot of are individuals who are learning to use AAC have processing difficulties or have motor impairments or vision skills that require more time, wait time in order for them to respond and generate the messages. It really is taking into account that time is necessary on two different fronts. BRIAN NORTON: Engage naturally. Does that just mean to make sure that I just talked to an individual the way I would talk to anyone else? How do you mean that? TABI JONES-WOHLEBER: Engage naturally refers to being respectful of the individual and engaging with them in such a way that you are equal communication partners to the extent necessary. But engaging naturally also means using the words — essentially core words, using words that are part of natural language, not necessarily – as the process of using lots of nouns and labeling. That’s really well known in the field of AAC. Nobody questions the use of core vocabulary by any stretch, but it’s just emphasizing and showing that engaging naturally does include mostly core words. There are some slides that demonstrate and spell that out quite powerfully in the context of language development and the use of language. But it also looks at how to engage in such a way that you are being respectful of an individual with regard to their emotional confidence. I think it’s a point that, when we are communicating with individuals who use AAC, we have a really important role to play in supporting their emotional confidence. Emotional confidence is the ability to understand one’s emotion and to be able to respond and have the language to understand those emotions. Often times, I think what we see is a child is having a rough day and they get an emotions board, and it says, “I am sad.” Okay, you are sad. Now let’s get back to math. But if I have a bad day and I am showing that, I’m given the opportunity to vent. I’m given the opportunity to talk about what’s not working and why it’s not working. I use language to work my way through that. In the end, I can cope better. I can get on with things. But I need the opportunity. For a kid who uses AAC, part of engage naturally is recognizing perhaps when things aren’t going well, or when they are going well, and given the language to talk about those things. You look sad. It looks like somebody took your favorite pen, pencil. That would make me sad too. Let’s see what we can do about getting it back. Or I know mom said you didn’t sleep well last night. It looks like you are tired. When I’m tired, it’s hard for me to pay attention too. But see we can take a walk to wake you up. And modeling “I want talk.” So giving kids the language to advocate for themselves to be able to express themselves in such a way that they can start to problem solve. They don’t learn that they which if we don’t give it to them. The only way they can figure out how to problem solve is through the modeling that they receive. There are kids out there that definitely figure it out, but for most — just being respectable of our interactions and honoring them, their humanity, as they work through it. BRIAN NORTON: For sure. Like anything else with kids, if you teach it that way, hopefully they’ll do the same with everyone they interact with as well. TABI JONES-WOHLEBER: Yeah. I think that language is so powerful in helping us internalize things like emotions and knowledge and understanding. Once we can assign words to it, it becomes that much more powerful inside of us. When we engage naturally with an individual who uses AAC, we are helping to give them that language to help them self actualize. BRIAN NORTON: I never thought about it that way. I really like that. Response not required? Elaborate on that for me. TABI JONES-WOHLEBER: Response not required is somewhat tied to statements more than questions. It really goes to the idea that — or wait time. There is a lot of overlap between these modules. Each is meant to be fairly explicit. Response not required is the idea that a child may not have an answer. They might just need you to give them space to think about it. I don’t think that this is terribly unique to any of us. I think we all benefit sometimes from space to think. When we take a position of response not required, we’re really employing a mindset that takes the pressure out of the interaction. But we are continuing to model and are continuing to provide opportunities to engage. It’s really just the idea that, even if the individual doesn’t have something to say in return, we just keep modeling. BRIAN NORTON: Sounds good. And then we presume competence? TABI JONES-WOHLEBER: Yeah. Presume potential is the phrase that I’ve used in here. It’s presuming potential – this is a big topic that we are talking about in AAC. Presuming potential is just assuming that a child is going, an individual is going to learn if we provide them the opportunities that are accessible to them to learn. So not having any preconceived notions about an individual’s upward level of achievement, not presuming he never has or never will. This module showcases several videos of the power of presumed potential. It also works through some examples of what happens when we usability- positive language and when we understand that language has bias, that the language we use can really shape the way the individual or their family or other service providers perceive them. BRIAN NORTON: The next one is appropriate prompting? TABI JONES-WOHLEBER: Appropriate prompting is a module that goes through what it looks like to provide a most-to-least or least-to-most hierarchy for prompting, and when those are appropriate. Ultimately, we know that prompting — the role of prompting is to shape learning by creating positive practice. But we want kids to be as autonomous as possible. When we are mindful of the way that we prompt, then we are better able to move toward that goal. It’s interesting, because as a speech pathologist, I feel like prompting was really drilled into me early in my career. But I think that that is perhaps unique to speech pathology or maybe other therapies – I’m not sure – because this is something that I think people get a lot from. This particular module I think creates a lot of “Aha!” Moments for individuals, just coming to an understanding that prompting is not something that we used to fill in dead space. It’s really meant to be purposeful. There is a goal in prompting to be able to fade it effectively to create more independent communicators. BRIAN NORTON: Lastly, let the child lead? TABI JONES-WOHLEBER: This one is somewhat self-explanatory. The emphasis for me for this module, the reason I felt like it was important, is really to talk about those most challenging students. These are the kiddos that get up and wander around the room. Maybe they clear the letters off the letter shelf in the alphabet center. Or they push over the blocks. They flip through books without ever looking to the pages. They just seem so busy. It can be difficult to get into their world and figure out where to start with communication. Before these kids, I think it’s so important to recognize what are they doing and why are they doing it? Like what sort of sensory seeking behaviors are they insurgent? Or what interests them? Who is it that they seem to have affection toward, that they’ll let into their world? And using that as our tool, as our foundation for moving forward and figure out what and how to bring communication to them. But when we let the child lead and we don’t have a preconceived notion about what activities we are going to use or what tools we’re going to use, but just really be kind of in their world for little while, it opens up opportunities that we perhaps would not have seen. I think a really important part of this is looking at that sensory peace. If you have kids that are crawling into tight spaces, then we know that they need a certain kind of sensory input. If we have kids that are running across the room and then stopping short, we know that they need a certain kind of sensory input. So how can we create that in meaningful ways to fit communication or shaped the routines of their days so that they are getting what they need so that they are available for learning in other ways? Of course, we want to let the child lead and follow their interest and let them be motivated, but on an even more perceptive level, this module is really helping to address the needs of some of our more complex students. BRIAN NORTON: I could see how that could be very helpful. If our listeners would want to find out more about the Model as a MASTER PAL program, or about you, how would they go about doing that? TABI JONES-WOHLEBER: I had a website. It’s CommunicationAACtualized.com, and actualized is spell A-A-C. so that’s one way. I also recently did a series on practical AAC about Model as a MASTER PAL. We did 11 weeks, one module per week. But the entire module is available through a bitly link. https://bit.ly/ModelasaMASTERPALtrainingmodule. BRIAN NORTON: Perfect. We will definitely make sure that those get in. TABI JONES-WOHLEBER: I do want to comment, it really is intended for all communication partners. This initially – it’s interesting. The first time I did this was with a small group of staff. It was really just a single page handout. I’m like, here are some talking points. I quickly realized that we just needed so much more. We needed to be able to figure out the direction of — the discourse needed guidance. I had another opportunity with some really supportive families and demonstrators. They set aside the time – we did it in rotation. All the staff and many families from an inclusive preschool and one of my schools, we set it up for them and did it throughout the morning over the course of several months. It was wonderful, a wonderful conversation between families, paraprofessionals, SLP’s, teachers, and everyone had something to contribute to the conversation, and everyone took something different away, and everyone had a different perspective on how they cite in their child or their students. It really is meant – this is something that’s meant to facilitate conversation over a long-term. This isn’t hey, let’s sit down and do a half day training. There are 10 modules, 11 modules, and they are really meant to be spaced out over time to keep the dialogue going about how we can do this better. I think that is such an important thing that is missing. When I provide training is, I’m often invited in, and I get an hour or maybe a half day or maybe we get to do a full day. But it’s once a year, that’s it. There is no carryover. People are excited and inspired, but then life takes over. This is really meant to be a way to keep the conversation going. Each module includes a PowerPoint. It has handouts. Most importantly is there is a facilitator guideline that walks through and has an explanation and talking points for each slide. So whoever — you don’t have to be an expert in the topic to share these modules. It’s really meant to be accessible so that we can have these important conversations and get people informed and excited about how to be a great indication partner. BRIAN NORTON: Very good. Thank you so much for being on the show. We will put all the information in the show notes. TABI JONES-WOHLEBER: Thanks for having me. This was fun. BRIAN NORTON: Have a great day.